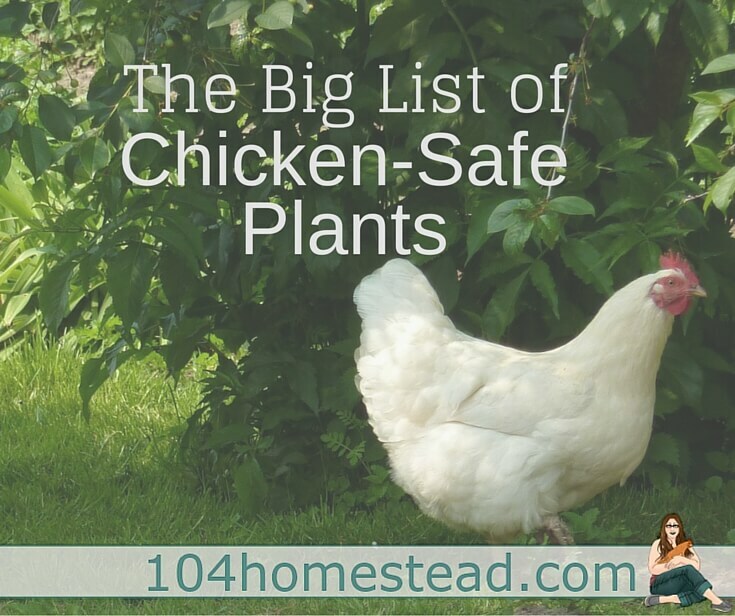 There are plenty of lists of toxic and unsafe plants for chickens, but it is very hard to find plant options that can be used in your chicken area. I have compiled a list of plants that are deemed chicken-safe. The following plants are appropriate and worry-free for the areas chickens roam. 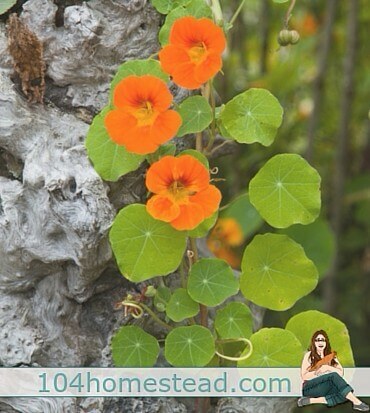 The list tells you the zone said plant grows in as well as if the plant is an annual or perennial. Some annuals can be over-wintered as perennials in warmer climates. Plants marked with an asterisk (*) have medicinal properties for chickens. If you find yourself wanting to landscape around your chicken’s enclosure, these plants will add seasonal color and are perfectly safe. Do you need year-round foliage to hide the less-than-aesthetically-pleasing areas around your chicken yard? These plants will do the trick. Many herbs benefit from a trimming. They tend to perform better and get bushier with regular pruning. Why not let your chickens prune for you? Vines are wonderful for growing up the side of a chicken enclosure. They offer shade in the summer and die back to allow for light in the winter. We have grapes and hops along the sunny side of our run. You may be worried about shrubs on your property when you begin to free-range your chickens. Although shrubs like azalea and rhododendron can pose a risk, these plants are perfectly safe. Bamboo 5-9 Be sure to plant the non-invasive variety! No need to be concerned about the fruit, nuts, and leaves of these trees dropping. Your chickens will happily clean up the mess and it won’t hurt them at all. Citrus (all) Keep in mind that too much citrus may cause weak egg shells because it affects calcium absorption. 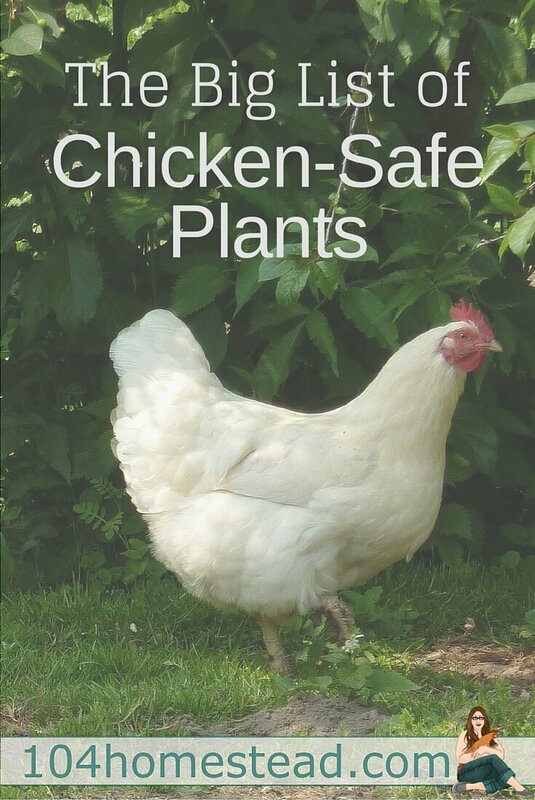 Keep in mind, just because a plant is “safe” does not mean it will be safe from hungry chickens. Be sure to check out the big list of poisonous plants if you are worried about a plant already located on your homestead. If you have a suggestion of a plant to be listed, let me know in the comments below. seeing / finding it? Is there a list of harmful and or Deadly Plants for Chickens as well? This is the list I commonly refer to (http://www.backyardchickens.com/t/627282/comprehensive-list-of-poisonous-plants-and-trees), but keep in mind that it isn’t detailed. “Poisonous” could refer to anything from digestive issues to fatal. We have quite a few things from that list on our homestead and our chickens have tasted and been just fine. Is there anything I can put around my gardens to keep roosters out? We have to that come into our yard and they have my flower gardens destroyed. I don’t, I’m sorry. I think a perimeter fence might be the only way to keep them out. My grand father was an Electrical Contractor, wiring Hospitals, banks and even high end homes. He started out wiring anything that was in need. He was great at coming up with home made “Fix It’s” of all kinds. To keep the chickens out of the garden He drove stops into the ground and 6″ off the ground he added an insulated. Then he would string the wire along each stob, pulling and stretching it to remove ALL sags and loosens and floppy wire. Since he already had electric freed around almost 20 acres of pasture he then twisted the chicken wire onto the Horses Electric fence to power it. When a Chicken gets zapped for walking into the wire, they pay close attention and never come close to it again. IMPORTANT: When he fenced off the garden wit the electric fence wire he also clipped the large feathers off one of the wings. Clipping both may still allow the chicken to gain some degree of life and fly over the Hot Wire. Clipping only one wing will make the chickens become lopsided and imbalanced when they do try to fly. .You can buy very small Fence Chargers for almost no money at Tractor Supply, Southern /stated and a good ?Hardware Store. Try to support your local Hardware guy! Those guys are more important to the Homesteader that you might know. You will most surely need some first hand advice from someone that wants to see you succeed. I don’t mind paying extra to support Mom & Pop businesses who try VERY HARD to keep Made in USA products in their store for us! Try getting advice or recommendations for anything from a Walmart Employee…if you can even find an Employee on the floor. What does the asterisk connote? Those are plants with medicinal properties for chickens. You can read more about that here.